A Black Friday backlash appears to be gathering force at a time some traditionalists are bemoaning the way that Halloween, with its kitsch and goofy costumes and edible eyeball cakes, is slowly supplanting Guy Fawkes Day. 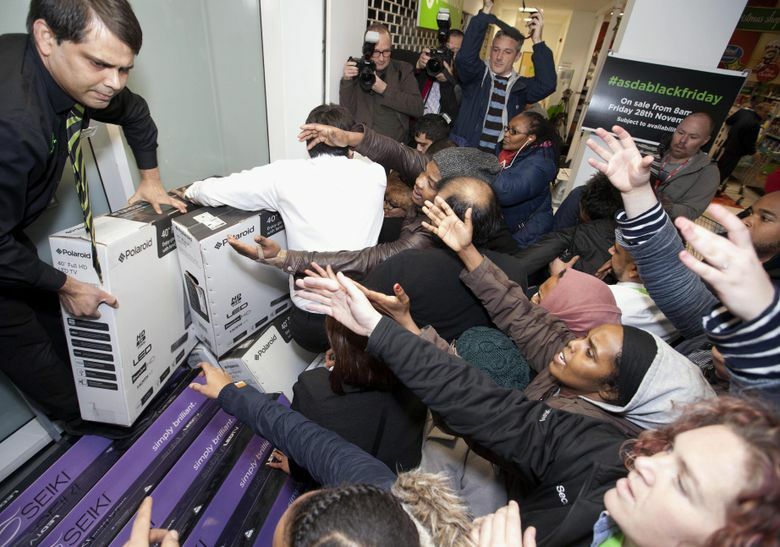 LONDON — The British don’t celebrate Thanksgiving, of course, but they have enthusiastically embraced another great American holiday tradition: Black Friday. A little too enthusiastically, it seems. Now, some retailers are trying to dial back the frenzy they unleashed just a few years after introducing the idea. That’s because, for a nation that prides itself on decorous behavior, last year was ugly. Or, what in America is called a typical Black Friday. At one flagship Asda store in northwest London, part of a retail chain owned by Wal-Mart, one woman was seen on the floor, desperately clinging to a 40-inch discounted television as several teenagers tried to grab it away. In Middleton, in Greater Manchester, 200 shoppers barricaded themselves in a Tesco store demanding the promised sale goods, even after all the stock had been depleted. The BBC reported that shoppers in different parts of the country had experienced gridlock, biting, pinching, punching, kicking and stock flying through the air as people leapt over barriers to get their hands on heavily discounted items. Police reinforcements had to be called in at stores all across the country for Black Friday, a name apparently coined by the Philadelphia Police Department in the early 1960s to describe the shopping and traffic turmoil that followed the holiday. “This year customers have told us loud and clear that they don’t want to be held hostage to a day or two of sales,” said Andy Clarke, the company’s chief executive. Instead, the retailer said it would offer discounts from November to January. Nevertheless, Black Friday seems here to stay in one form or another, leading many to question why their country has so quickly adopted a distasteful commercial binge that exists in the United States only because Friday is a holiday for many people. Indeed, a Black Friday backlash appears to be gathering force at a time some traditionalists are bemoaning the way that Halloween, with its kitsch and goofy costumes and edible eyeball cakes, is slowly supplanting Guy Fawkes Day, the four- centuries-old British festival that falls on Nov. 5. She noted that even her tiny manicure shop in West London had emailed her its Black Friday discounts. Sensing a populist cause, some members of Parliament — including Jeremy Corbyn, who is the opposition Labour leader — put forward a nonbinding motion in the House of Commons in January railing against large retailers who chose to adopt “the American retail custom of Black Friday,” saying it was an affront to public order and a drain on police resources. Sir Peter Bottomley, a Conservative member of Parliament, said he had signed the motion after several shoppers were seriously injured during Black Friday shopping skirmishes. “In a country of polite queuing, some people forgot British patience because they were so excited about special offers,” he said. How Britons came to embrace Black Friday seems to reside in a mix of canny unbridled capitalist opportunism, the fetishizing of things American, the explosion of online shopping and two giant retailers called Wal-Mart and Amazon. The British media have credited Amazon with first importing Black Friday in 2010, when it started to offer Black Friday discounts, spurring other retailers to follow suit. But it was when the retailer Asda, inspired by its parent company, Wal-Mart, began marketing Black Friday offers in stores two years ago that the phenomenon really took off, according to the company. Black Friday is big business in Britain, and the Center for Retail Research estimates that online spending alone Friday will reach 966 million pounds, or $1.46 billion. Last year, giant retailer John Lewis said Black Friday resulted in the busiest sales week in its 150-year history. EBay predicts 9 million Britons will visit its website Friday, buying 25 items every second. John Lewis said it would be announcing unspecified discounts on unspecified electrical items that would remain top secret for unspecified reasons until Black Friday began. Asked why the chain had embraced Black Friday, Jack Gorman, a spokesman, appeared to attribute the phenomenon to a pack mentality. At a branch of traditional retail chain Marks & Spencer in Islington, North London, a giant sign on the store’s window promoted “Black Friday Weekend” and 50 percent off on selected items, including cashmere sweaters, nightwear and Christmas crackers. Valerie Faulkner, 41, who was walking through the store, said she initially had no idea that Black Friday was a U.S. tradition until she searched for it on Google.